10am - 6pm throughout the season. Have the ultimate adventure at the Land of Make Believe. Family favorites include our million dollar Action River Ride, a Roller Coaster, Buccaneer Pirate & Wading Pool, Tilt-A-Whirl, Civil War Locomotive, Hayride, Old McDonald's Farm, Middle-Earth Theater, "Black Hole" #1 Rated Waterslide, Grand Carousel, Sidewinder, Pirates Fort, Pirates Cannonball, the Brand New Pirate's Plunge, Jump Around Frog and Lots, Lots More. 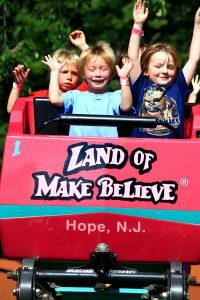 As New Jersey's Premiere Family Amusement & WaterPark, the Land of Make Believe features Safe and Wholesome recreation, entertainment and activities for real families like yours. You'll find Exciting Rides, Shows, Attractions, Games, WaterPark, and Picnic Area on over 30 acres. The Land of Make Believe and Pirate's Cove has been designed exclusively for an action-packed day of special family fun for parents and their children. Click here for more details!!! Note to our visitors Land of Make Believe coupons and specials can change without notice. So please visit their official website to make sure of the latest pricing and coupons.